Close games have been a hallmark of the Tigers men’s basketball team’s season. After losing their first two games against UPEI this season by a combined total of five points, the Tigers finally won a close game. They trailing by 11 points with under 10 minutes to play in last Saturday’s match, but played hard down the stretch to finally take an 89-88 lead on a Kashrell Lawrence’s free throw with 25 seconds remaining. The day before, Dalhousie fell 81-66 to the Panthers. Lawrence was the game’s high scorer with 25 points, and was complemented by the play of point guard Richie Kanza Mata. Kanza Mata was Dal’s player of the game, finishing with a triple double of 16 points, 10 rebounds and 13 assists. 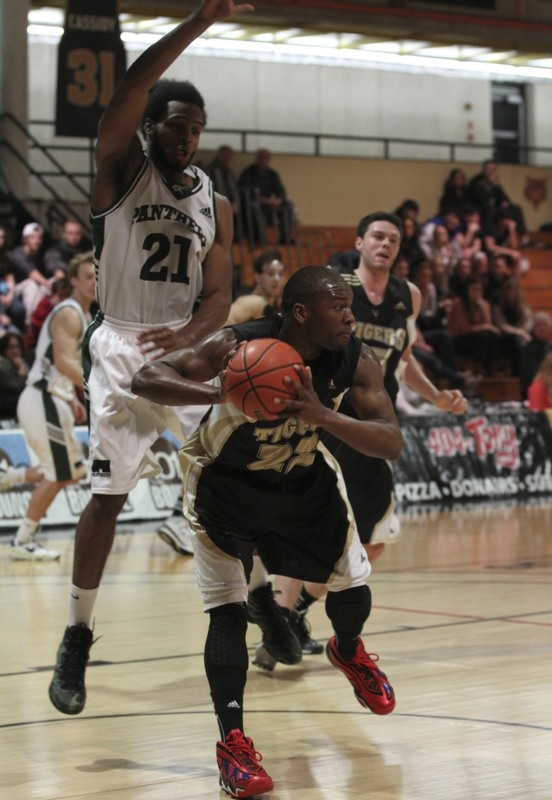 In last Friday’s game, UPEI used a full court press to force Dal into 17 turnovers. During practice on Saturday morning, Dal worked on techniques to break the press that had given them so much trouble the night before. “We just looked to attack to score, instead of attacking just to beat the press… we got easy layups,” says Lawrence. With the press broken, the Tigers continued to slash to the basket, making many contested shots in the paint. However, the physical play of both teams would prove costly for Dal. With 3:27 left in the second quarter, forward Devon Stedman injured his ankle going for a loose ball, and at 9:11 of the fourth Chidi Majok popped out his shoulder when he landed awkwardly. Although the injuries will make it tougher for the team, head coach Rick Plato thinks there is an opportunity to be had. “You know what they say about adversity… we’re down in the standings, we just lost one starter and another key guy coming off the bench, everybody’s just gonna have to rally around it and perform,” he says about the 3-11 Tigers. The seventh-place Tigers will take on Memorial on Feb. 8-9 in two four-point games at the Dalplex.